The Elder Scrolls V: Skyrim Special Edition is a remastered version of Skyrim released in October 2016 and only available on PC, Xbox One and PlayStation 4. Special Edition is 64-bit and built on an updated version of the Creation Engine that Bethesda Game Studios used for Fallout 4. The remastered game features high-resolution textures, upgraded graphic effects including new shaders and volumetric god rays, and dynamic field-depth. Skyrim VR is a variant based on Special Edition but only supports virtual-reality headsets. Special Edition includes all three official add-ons, Dawnguard, Hearthfire, and Dragonborn. An in-game mod browser is introduced, allowing players to download approved mods from Bethesda.net. This support is extended to players of the console versions for the first time in the series, although PS4 players cannot use mods with custom-made assets. The Creation Club offers paid official add-on content exclusive to the Special Edition. Special Edition has all the original Patches installed, and there is ongoing patch support with the Special Edition Patch. For updated system requirements, see the official specifications. Saved games are now categorized for each character and grouped and displayed separately on the main menu. Saving the game in a cell that has an underscore in its EditorID will cause saved games to not be categorized correctly. No such cells are present by default, but may be added by mods. Pressing the Esc key on PC now always opens the Journal instead of the System menu, even if this button is not configured to do so. Torturer's Hoods are now marked as playable and can be obtained as loot from the Torturer and generic Thief NPCs. They could not be obtained or used in the original release. Reverting from Beast Form will automatically reequip the items you were wearing before transformation. In the original release, your character would always be naked after reverting. When being arrested in Winterhold stolen items are now confiscated, though they end up in the evidence chest in Dawnstar. Vampire attacks on settlements introduced with Dawnguard have been permanently disabled. Achievements and trophies are tracked separately for Special Edition and do not carry over from the original game. Achievements and trophies are disabled when the Special Edition is loaded with mods on both PC and console. However, the use of console commands does disable them. Mods had no effect on achievement progress on the original release. Steam trading card support has been removed. Kinect Command support has been removed. Although this feature was present on Xbox 360, it has not been carried over to Xbox One. Skyrim Special Edition is 64-bit and has been updated to use DirectX 11, giving superior stability and performance compared to the original release. The game can utilise more than 4GB of memory without need for modifications. Special Edition has a native option for borderless windowed mode in launcher settings. The game can support vastly more actors on-screen than the original release. Alt-tab performs smoothly with the game and does not cause the visual issues that could occur in the original release. Loading screens are now 60 FPS. New engine and scripting functionality has been introduced to accommodate Creation Club content. A message of the day appears on the main menu advertising Creation Club content (introduced in Patch 1.5). Screen space ambient occlusion (SSAO) is now supported. Rain and snow occlusion is now supported, and is an optional visual setting. Flow-based water shaders have been added and enabled for all bodies of water. Temporal anti-aliasing support (TSAA) has been added as an alternative visual option to Fast Approximate Anti-Aliasing (FXAA). Shadows now display in full resolution, no longer appear blocky or striped, and move smoothly instead of in increments. Trees and flora are in higher-resolution. The exterior worldspace features vastly more detail, e.g. extra grass, rocks and flora. Shoreline wave effects used on Solstheim in Dragonborn are now used across Skyrim's shorelines too. Character generation now morphs between face archetypes instead of abruptly changing. A subtle sun flare effect has been added to light sources. Special Edition has a warmer and more colorful visuals compared to the original release. Audio is severely compressed and consequently much lower quality than in the original release. Special Edition introduces an in-game mod browser via Bethesda.net. The mod menu, displaying load order and allowing mods to be enabled or disabled, is now accessed from an in-game menu. The launcher mod menu has been removed. Mods can be enabled and disabled at any time in-game, though the game will immediately reload all assets. Console version players may download approved mods for the first time, though they must have an account at Bethesda.net. PS4 support is limited and only allows the use of mods utilising assets already included within the game. Custom assets are not permitted. Xbox One users are limited to using up to 5GB of mods. Steam Workshop support has been removed in favor of using Bethesda.net. Creation Kit has been updated to 64-bit. The original Creation Kit is not compatible with Special Edition. Special Edition ESM and ESP plugins use a slightly different format to the original release. Plugins for the original release need to be updated in Creation Kit 64-bit to work correctly with Special Edition, and assets and archives must be updated to the new formats. The ESL format has been introduced for Special Edition with Patch 1.5. It is primarily used for Creation Club content, but can be used for custom mods as well. ESL files do not count towards the 255 plugin limit but do have other limitations. Note/Scroll flag is deprecated, and all notes are now flagged as Book/Tome. Several issues from the original release of Skyrim and Dawnguard have been fixed for Special Edition. Fires no longer display a thin black line around them (issue originally introduced with Classic Patch 1.6). NPC lip movement is no longer desynchronised with their dialogue. Z-fighting issues on mountains in Whiterun Hold have been resolved. The Glass Helmet of Resurgence is now properly named and no longer mistakenly called "Glass Armor of Resurgence". 21 trees and shrubs have had their 3D positions corrected. Some textures that had visual issues have been fixed. The boats at Icewater Jetty no longer overlap. Dawnguard.esm no longer strips A Daedra's Best Friend quest of most of its script properties. Argonians are now properly displayed in the Creation Kit instead of appearing as disembodied tongues and eyes. 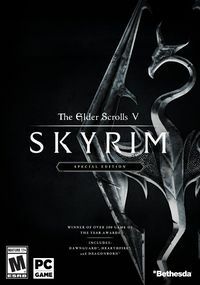 PC players can use unmodified save files from the original game by copying or moving the save file from the Skyrim user folder to the Skyrim Special Edition user folder. Some modded save games may function on Special Edition if all of its mod dependencies are present. If a "This save relies on content that is no longer present" warning is displayed when loading a modded save from Skyrim on Special Edition, then that save must not be used at all and may crash the game upon attempting to load. Characters from ported save files will not be displayed separately on the main load menu. This can be fixed by opening the console, typing the command showracemenu and then immediately saving changes. Save files from Special Edition cannot be used at all in the classic version of the game. Achievements are disabled when using mods. A warning will be displayed when loading a save with ESP plugins enabled, and future save files will be prefixed with [M] to denote it as a modded save file. ESP and ESM files for Special Edition are not compatible with the original release. The game will not launch if a Special Edition plugin or BSA archive is in the Data folder. ESL files are ignored by the classic version of the game as it does not support the format. Mods for the original release must be updated to function correctly on Special Edition otherwise they may crash the game. Mods that edit exterior cells with water in them will also need to include additional water flow information to support the new shaders, otherwise water will not be displayed correctly. The add-ons Fall of the Space Core, Vol 1 and High Resolution Texture Pack are not officially available for Special Edition as Bethesda has not ported them. The High Resolution Texture Pack is obsolete as the game comes packaged with higher-quality textures by default. Flow-based water shaders and screen space ambient occlusion were originally developed as part of the Game Jam. This page was last modified on 31 January 2019, at 20:58.